The 2016 Nissan Rogue is a sporty small crossover SUV that offers a smooth ride, three rows of seating, and impressive safety features. Inside, the Rogue is handsome and accommodating. High-tech infotainment gadgets provide major appeal for modern buyers. On the road, the Rogue impresses with its refined manners and responsive handling. Fuel-efficient powertrain options help you save big at the pump. 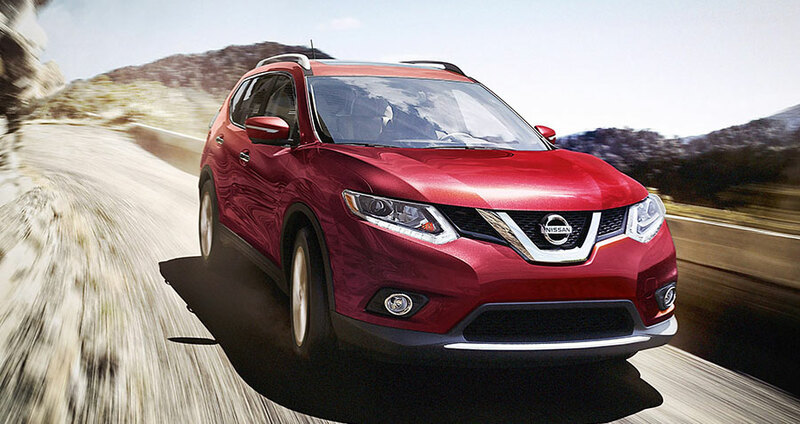 From behind the wheel, you'll love the 2016 Nissan Rogue's responsive performance and ample acceleration. It's always easy to merge onto highways or get around slower vehicles. The Rogue's suspension is specially tuned to provide a smooth, comfortable ride. Whether you're traveling around town or cruising the highway, you can expect excellence. At highway speeds, the Rogue cabin remains calm and peaceful, with minimal road or engine noise. Under the hood, the Rogue's 2.5-liter four-cylinder engine offers 170 horsepower and 175 pound-feet of torque. That's more than enough output for swift highway sailing. The engine is paired with a continuously variable transmission for optimal fuel economy. The Rogue earns up to 26 city/33 highway mpg to help you save big on gas. Choose all-wheel drive to enhance the Rogue's performance on slick or snowy roads. If you've got safety on your mind, the Rogue will put you at ease. The Insurance Institute for Highway Safety gave the Rogue its top score of "Good." In government crash tests, the Rogue earned an impressive four out of five stars for overall protection. In addition to impressive crash scores, the Rogue also provides high-tech safety systems to maximize protection. The blind-spot warning system alerts you when it senses a vehicle you might not be able to see. The forward collision warning system provides automatic emergency braking to help you avoid needless accidents. The AroundView system offers a top-down, 360-degree view of the Rogue, making it easy to navigate parallel parking spaces. Inside, the 2016 Nissan Rogue is spacious and refined. The NASA-inspired Zero Gravity front seats supply endless support and comfort - in fact, they're among the most impressive seats on the road today. The second row slides fore and aft up to 9 inches, maximizing long-term comfort for taller passengers. If you require extra passenger space, opt for third-row seating - a rarity in this segment. Behind the optional third row, the Rogue sports 9.4 cubic feet of cargo space. Fold down both rear rows to create 70 cubes of max space and transport larger items. Finally, the Rogue treats you to a wide range of modern tech features. The NissanConnect system provides smartphone integration, so you can stream your favorite music or keep up with friends on the go. Keyless entry and ignition let you make a quick getaway from the parking lot. The navigation system guides you around new territory without a hitch. The Rogue SL is the line's most impressive model, offering a long list of high-end features. The power liftgate gives you easy access to the cargo hold. Leather upholstery and a leather-wrapped steering wheel create an air of interior refinement. The SL also gives you Siri Eyes Free connectivity, so you can access iPhone features without looking away from traffic. The Rogue is more than merely accommodating - it's luxurious. Transform the Rogue into a serious people-hauler with third-row seating. All passengers enjoy a first-class view of the sky above. Enjoy unlimited access to your favorite infotainment options. The 2016 Nissan Rogue is a premium pick for families and socialites who crave three rows of seating, rich interior comfort, and excellent fuel economy. On the road, the Rogue is comfortable and refined. Inside, the cabin provides ample passenger space and support. High-tech features keep you connected and maximize convenience. Advanced safety options underscore your peace of mind. Take the Rogue out for a test drive today!